One in six neighbors in the Tri-State area is at risk of hunger. We work year-round to help address the need. At the Freestore Foodbank, we see food as a vehicle for a larger conversation; it helps us to connect our neighbors to programs and resources aimed at creating stability and self-reliance. One of these programs is Second Course. Second Course is an extension of our Cincinnati COOKS! culinary job training program. Upon graduating from COOKS! students are eligible to enroll in Second Course. The free eight-week program provides higher skills training for management opportunities and employment in fine dining restaurants. Class sizes range from four to eight students. All students receive well-rounded, thorough training. Since its inception, more than 150 students have graduated from the Second Course program. Students also gain experience through Chef’s Table, a personalized four-course dining experience held in our commercial Rosenthal Community Kitchen (1141 Central Parkway). 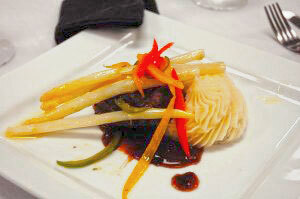 These events allow students to plan, execute and serve a gourmet meal. Booking a Chef’s Table gives you the opportunity to experience our Second Course program firsthand while providing an invaluable experience for our students. Work directly with our executive Chef to create a menu designed specifically for you and your guests. Prices vary by menu selections, but average about $50 per person. Accommodations for parties ranging from eight to 40 attendees are available for various lunch and dinner times. To learn more about planning a Chef’s Table, please email Tony Lavatori or call (513) 482-3670.